I am reminded of a history channel show about the founding fathers last week. Those wonderful words all men are created equal. The obvious clever political speak of not placing the three words but black slaves in the final draft. Since Jefferson and others just happened to own a few black slaves, I often wonder how those in power at the time, resolved this obvious conflict of thought. You must take it all in its historical context. The Revolution was led by white men of the privileged land class, many whom owned slaves; the revolt of course included poor and the lower classes of the urban areas, and the peasant class – the frontierspeople – these people did not own slaves. Native Americans were also left out. A lot of colonists did not support the Revolution – I’ve seen estimates of up to a third, and many New Yorkers. But at the time, it was a forward, progressive, revolutionary anti-colonial, even anti-imperialist movement. It was a national liberation movement; if you look at many of the more modern national liberation movements, you will find that they are led by class traitors from the bourgeoisie and inspiring members of the petit-bourgeoisie. At any rate, Martin Luther King clearly had an deep affect on all of us, on our society; it will never be the same, and we will never be able to go back. Our next president could be Obama who was born the year MLK made the speech. When he speaks, I’m reminded of King. And he wants us to be reminded of him. There was an article in today (1/21/08) Union Trib about how King was not “liked” by the establishment in 1968 – the year he was assassinated. He had come out against the Vietnam War and was dealing with poverty issues when killed. In His Own Words — Martin Luther King Jr.
Civil rights leader Martin Luther King Jr. inspired a nation to change largely through his riveting speeches. Considered one of the greatest orators in United States history, his thoughts on racial equality have been repeated by many speakers throughout the years since his assassination. 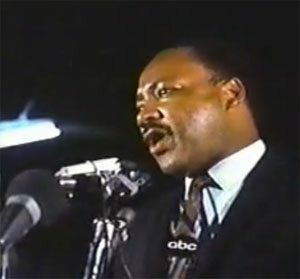 His skill with words powered King’s nonviolent battle for integration and equal rights. Here are 10 quotations from the eminently quotable activist. 1. He who passively accepts evil is as much involved in it as he who helps to perpetrate it. — “Stride Toward Freedom,” 1958. 2. The ultimate measure of a man is not where he stands in moments of comfort and convenience, but where he stands at times of challenge and controversy. — “Strength to Love,” 1963. 3. Injustice anywhere is a threat to justice everywhere. — “Letter from Birmingham Jail,” April 16, 1963. 4. Nothing in the world is more dangerous than sincere ignorance and conscientious stupidity. — “Strength to Love,” 1963. 5. Freedom is never voluntarily given by the oppressor. — “Letter from Birmingham Jail,” April 16, 1963. 6. The means by which we live have outdistanced the ends for which we live. Our scientific power has outrun our spiritual power. We have guided missiles and misguided men. — “Strength to Love,” 1963. 7. Nonviolent direct action seeks to create such a crisis and foster such a tension that a community which has constantly refused to negotiate is forced to confront the issue. — “Letter from Birmingham Jail,” April 16, 1963. 9. Nonviolence is a powerful and just weapon. It is a weapon unique in history, which cuts without wounding and ennobles the man who wields it. It is a sword that heals. — “Why We Can’t Wait,” 1964. Older Article: The Hippies Were Right!